Spencer School is in the Westfield Section of Middletown on sixteen acres of land. Extensive playing fields in the back are shared with Park and Recreation sports teams. A diverse population of about 380 students attends Spencer School in grades K-5 occupying the more than 48,500 square feet that make up the interior of the building. The original school opened in 1951 with an addition in 1958. 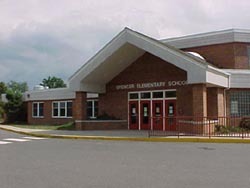 In 1989, Spencer re-opened after being closed for a number of years, sporting a new auditorium, cafeteria, media center, general office areas, art and music rooms, as Middletown's eighth elementary school. Originally named West Side Elementary School, Spencer was re-named in 1955 to honor Bertrand E. Spencer who was a prominent attorney in Middletown. Born in Meriden in 1884, he died in Middletown in 1941. Among his accomplishments, he served as State's Attorney General for Middlesex County, Mayor of the City of Middletown, Chairman of the Middletown Town Board of Education and a member of the Building Committee for Woodrow Wilson High School. Spencer School's primary playground was built and dedicated in 1961 to celebrate the life of Robin Archer, whose life was cut short at age 7 when she was hit by a car crossing Westfield Street. Our courtyard also bears her name. A fund was established in Robin's memory to maintain the playground equipment and courtyard plantings and other accessories that can enhance the courtyard for student, staff, and parent use.